The original 8mm cine film format, available from the 1930's, but used mainly in the 1950's and 60's was called 'Regular 8' or 'Standard 8'. This format was later replaced by an improved variation used mainly in the 1970's and 80's called 'Super 8'. 8mm cine film was originally returned from the processor on 50ft (3" diameter) reels, which ran for around four minutes. However, these have often then been joined or 'spliced' together by the user onto larger 200ft / 5" diameter or 400ft / 7" diameter 8mm film reels. There is usually a gauge on the side of the larger 8mm film reels, to help you calculate how much cine film is on the reel. Standard 8mm cine film can be identified by its 8mm width and rectangular sprocket holes. Standard 8mm home movie cine, both silent and sound, usually runs at 18 frames per second, 13.5 feet / 4.1 metres per minute. Standard 8mm commercial cine film, both silent and sound, usually runs at 24 frames per second, 18 feet / 5.5 metres per minute. Early 8mm film is often still found in it's original Kodak cardboard mailing boxes. Sometimes it is pointed out to us that on these original boxes containing standard 8mm cine film, it states that the reel contains 25ft of film. This is because early standard eight cine film was indeed supplied in 25ft lengths, but was 16mm wide. The user ran the film through the camera, filming onto only one side of the film, and at the end removed the cine film from the camera, flipped it over and ran the film through again. The film processor then split the film down the middle and spliced the two ends together to produce 50ft of processed 8mm cine film. Later Standard 8mm cine film is often still found in it's original Kodak yellow mailing envelopes. Standard 8 was eventually replaced by Super 8mm cine film which has square sprocket holes, a larger image and a larger central spool hole. Super 8mm home movie cine film is often still found in it's original Kodak yellow mailing envelopes. Super 8mm home movie cine film, both silent and sound, usually runs at 18 frames per second, 15 feet / 4.6 metres per minute. Super 8mm commercial cine film, both silent and sound, usually runs at 24 frames per second, 20 feet / 6.1 metres per minute. 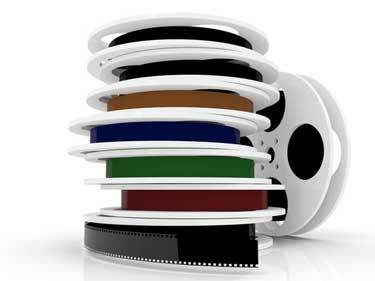 Size of 16mm film reels range from 100ft to over 2000ft. Silent 16mm cine film can have sprocket holes on one or both sides, and usually runs at 18 frames per second, 27 feet / 8.2 metres per minute. Sound 16mm cine film has sprocket holes on one side only, and usually runs at 24 frames per second, 36 feet / 11 metres per minute. The majority of 16mm sound film used an optical track. This can be seen when held up to the light as a 'squiggly' line down the side of the film. Less common was magnetic sound, mainly used by amateurs recording a new soundtrack. We can transfer and convert from all 16mm film reel sizes, running speeds and soundtrack types. 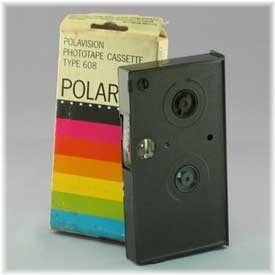 Polaroid used a system incorporating 38.5ft of self processing 8mm film in a cassette, called polavision phototape. The film cassettes could only be viewed on Polaroid's own tabletop player and not a film projector. These films tend to be more grainy and darker than regular 8mm film. They are also more prone to deterioration. Our technician can prepare and transfer these now delicate films to any digital format. If the film features sound, we will transfer it, synchroniized to the moving image. 8mm amateur film with sound was usually filmed at 18 FPS (frames per second), while 8mm professional / commercial film was usually filmed at 24 FPS. The sound can be found in the form of a magnetic strip, which can be seen as an orange / brown line along the edge of the film. 16mm sound film mainly ran at 24 FPS with sprocket holes on one side (as opposed to both sides on silent film). The majority of 16mm sound film used an optical track. This can be seen when held up to the light as a 'squiggly' line down one side of the film. Less common was magnetic sound, mainly used by amateurs recording a new soundtrack after the film had been shot. If your cine films are silent, we can add an appropriate soundtrack to make your production 'complete'. We can supply a musical soundtrack, or alternatively the sound of a vintage running cine projector. If you would prefer to supply your own soundtrack, on tape or CD, we can accommodate this (copyright permitting). Reels over 3" often have a footage calculation gauge on the side.